Maria Gil didn’t plan to open a restaurant featuring Colombian soup. She left her native city of Medellin, Colombia, to work for a media company in Raleigh, then came to Charlotte as a top manager for pioneering Latino radio station LaTremenda. 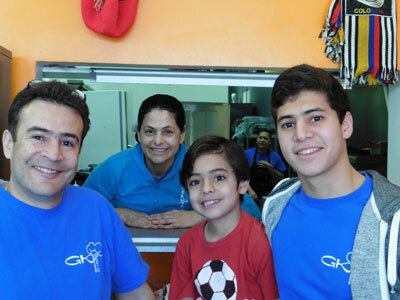 But when her second child was born, she and husband Jose started looking for a business where they could work together. Last year they launched Gil’s Kitchen in a narrow shoebox of a space at Sharon Lakes Retail Center off South Boulevard. Jose greets customers front-of-house, remembering names, admiring babies, shaking hands, kissing cheeks – and selecting the bubbling soundtrack of salsa and Colombian pop oldies. Sons Santiago and Sebastian help out after school and on weekends. Maria Gil in the kitchen cooks a full menu of Colombian favorites from empanada appetizers to two-layer flan/chocolate “impossible cake” for dessert. But a standout is the soup, a different one made from scratch each morning. On weekdays look for vegetable soup: maybe crema de zanahoria (cream of carrot), or sopa de lentejas, (lentil), or crema de cebolla (cream of onion), or sopa de calabazo (pumpkin), or sopa de tostones (plantain). 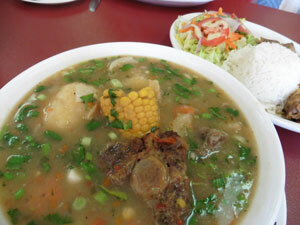 Weekends, the white board by the door (and the daily Facebook post) often list a sancocho –Colombia’s national soup. Broth, potatoes, potato-like yucca, carrot and plantain chunks, and bits of onion simmer together for hours. Chicken or oxtail cook separately til spoon-tender. Minutes before serving, Maria adds the meat plus corn-on-the-cob and a sprinkle of cilantro. On a separate plate there’s a hillock of white rice to spoon into the soup, as well as a salad. It’s a comforting meal for a Spring day. 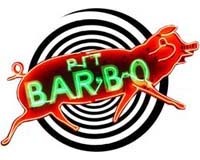 Monday – Saturday 8 a.m. – 8 p.m.